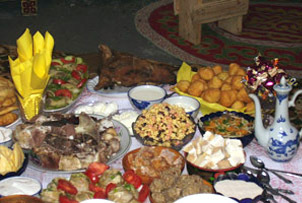 There are a café and dining room, where you can order breakfast, dinner and lunch of standard or it can be authentic local Altay cuisine. Breakfast: rice porridge, pancakes with cottage cheese, cheese, honey, bread, phyto tea. Lunch: borscht with meat, vegetable salad, bread, sweets, phyto tea. Supper: azu (a dish of thinly cut meat with hot sauce), honey, bread, phyto tea. Cost: 580 rub/$20 per person.